Welcome to the Church of S. Augustine, Kilburn. Consecrated in 1880 and affectionately known as the 'Cathedral of North London', S. Augustine's is an Anglo-Catholic Parish Church of the Church of England with roots in the Oxford Movement and a proud tradition of serving its vibrant and diverse community with an active programme of worship and outreach. 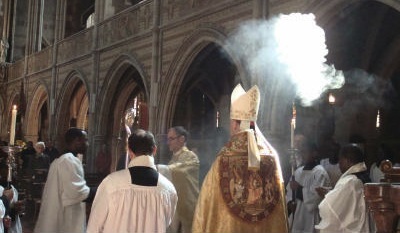 We are a Forward in Faith parish under the Episcopal care of the Bishop of Fulham. The parish lies within the Two Cities area of the Diocese of London in the Archdeaconry of London and the Deanery of Paddington. Our patron is the Society for the Maintenance of the Faith. The church is generally open half an hour prior to the advertised service times and for up to 20 minutes afterwards. Additionally there is normally access on Saturdays from 9.00am - 3.00pm. We look forward to welcoming you to our church.